We have recently introduced green cleaning to the Tulsa Metro Area. 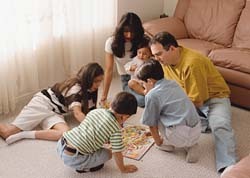 Our company helps you to protect your family from toxic chemicals commonly used in the carpet cleaning industry. By combining powerful steam cleaning with safe, effective cleaning agents we can give your family the cleanest carpet possible. We are locally owned and operated, and bonded and insured for your protection. NO: Glycol Ether, Linear Alcohol from Crude Oil, Butyls or Silicones, Caustics, Borine or Chlorine, Nonyl Phenol, MEA, EDTA, TEA, Quaternaries or Phenols, Carcinogens, Artificial Fragrances or Colors. WE USE: Natural Live Enzyme Cultures, Citrus Peel and Lime Extract, Corn and Coconut Bases, Botanical Extracts, Vegetable Fiber, Soybeans, Grapefruitseed Extract, White Cedar Leaf Extract, Meadow Foam Seeds, Aloe Fiber, Cider Vinegar, And Cold Pressed Essential Oils.